jennie's nails and tales: Another Book Swap Success! The first time I participated in a Book Swap, my partner flaked and I got nothing (boo). The second time, I was introduced to some fabulous books that I probably wouldn't have picked out myself (yay). And this time, for my third Book Swap, although there was a small logistical hiccup, everything worked out, in the end. I was paired with the adorable Myra from The Little Aslam and, after a few emails, she really figured me out. So well, in fact, that she sent me Tina Fey's Bossypants. The only bummer is that I'd already read it. However, with some quick online researching, we sussed out that it was possible to get a credit on Amazon (yay). Then, in the wee hours of the morning, the idea hit me square in the nose: Mindy Kaling! She's sort of like Tina Fey but edgier and they're both on TV so, in actuality, Is Everyone Hanging Out Without Me? is almost like Bossypants. And that is what I spent my credit on. Thanks, Myra! I can't wait to get started! And thanks to Heather and Katie for arranging the Book Swap! 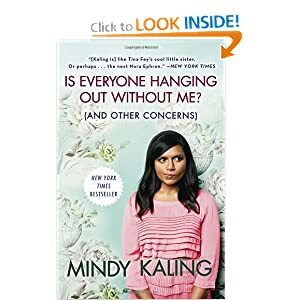 I just finished reading Mindy's book - while different from Tiny Fey's book, you can't help but love Mindy and her quirks! enjoy!